The Society for Peace Unity and Human Rights for Sri Lanka (SPUR) joins other nationalist organisations in strongly rejecting the constitutional changes proposed in the report recently tabled at the Constitutional Assembly by Prime Minister Ranil Wickremasinghe. Under those proposals, Sri Lank will be converted from a ‘Unitary State’, which has an internationally recognised meaning, into a deceptively named ‘Aekeeya Rajyaya’ or ‘Orumiththa Nadu’ composed of the Centre and Provinces. This is a significant deviation from the Tamil term ‘Otriyatchi’ used in the current Unitary constitution. Furthermore, the Provincial Governments will be granted extensive executive and legislative powers including those on state lands and finance. The ‘Concurrent List’ will be weakened or entirely eliminated. The Sri Lanka Police will be split into a National force and nine Provincial forces. This will not only compromise nationwide operations against terrorism, drug trafficking and major organised crime but will also allow separatist leaders to abuse the Provincial Police for their own purposes, including against the other armed services of Sri Lanka. Also included are provisions for two or three adjoining Provinces to merge, subject to a referendum held only in those areas. In addition to disenfranchising the remaining population of Sri Lanka, this would allow the re-merger of the Northern and Eastern Provinces to create a mythical ‘homeland’ as claimed by the Tamil separatist and the pro-LTTE diaspora. The proposed Second Chamber, largely manned by Provincial Councillors, will further dilute the Unitary status of Sri Lanka by allowing ‘peripheral’ politicians, who have not been elected at a nation-wide election, the virtual power of veto over the Central Legislature. Partisan representatives, particularly from the ethnic separatist parties, will make the country ungovernable and the passage of legislation a recurring exercise in wheeling and dealing. At present, the Executive President of Sri Lanka is directly elected by all its citizens regardless of ethnicity, religion or regional interests. This allows the peoples’ sovereignty over the entire nation to be exercised by the President and through the Provincial Governors, thereby acting as a counterweight to the separatist features of the 13th Amendment. However, under the proposed constitution, a titular President is to be ‘appointed’ by a simple majority of the ‘joint chambers’. As the recent events in the legislature clearly demonstrate, this leaves the appointment highly vulnerable to political manipulation, financial incentives and foreign interference. In addition, the executive power of the Provinces will be exercised by the Chief Minister and the Board of Ministers, with the Governors being reduced to the status of a mere figureheads. It should not be forgotten that Sri Lanka was able to withstand a three-decade long campaign separatist terror, which saw large parts of the Northern and Eastern Provinces under LTTE control as well as well as a ‘Unilateral Declaration of Independence’ by the Chief Minister of the temporarily merged North-East, due to its strong Central Government and the Executive Presidency. The draft Parliamentary electoral system is both convoluted and unrepresentative, with many members to be appointed through party lists rather than by the people’s choice. Apart from being a financial burden due the increased number of legislators, the appeasement of separatist forces is further demonstrated by the allocation of four Parliamentary seats over and above their calculated entitlement to the Northern Province. Another suggested amendment is to the wording of the article on Religion, which requires ‘The Republic of Sri Lanka to give Buddhism the foremost place. The objective of this change can be interpreted as an attempt to dilute this obligation of the State towards safeguarding Buddhism. Not surprisingly, the draft constitutional changes are being strongly supported by the United National Party (which has not put forward any dissenting views or alternatives) as well as the Tamil National Alliance and the Janatha Vimukthi Peramuna, with backing from some Non-Government Organisations and foreign powers which seek to weaken the Sri Lankan State. Fortunately, their attempts to convince the public that Sri Lanka will benefit from this hasty and divisive attempt to alter the nation’s supreme laws is already being challenged by nationalist organisations, professionals as well as leaning Buddhist monks. In conclusion, SPUR firmly believes that the composition of the current parliament, elected three and a half years ago, no longer represents the will of the people. 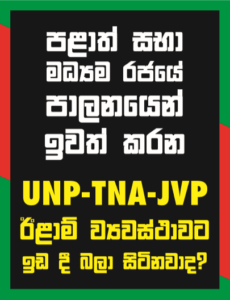 The Wickremasinghe regime has become a minority government which needs TNA and/or JVP support for its survival. Its popularity has hit an all-time low as shown by the local government elections of February 2018. While it is agreed that constitutional improvements are required, this task should be left to a future parliament that has a mandate based on the proposals presented to the people at a General Election. Hence, we urge the Joint Opposition, the SLFP as well as the patriotic members of all other parties to oppose any moves to abolish the Executive Presidency and dilute the Unitary status of Sri Lanka.